The Sprint iPhone 6 your friend gave you is a model A1586 which is compatible with the Sprint network. If that iPhone is unlocked it should also be compatible with the AT&T, Verizon, and T-Mobile networks too. Since you were able to move the SIM from your iPhone 5 into the phone and it worked the phone is probabally unlocked. 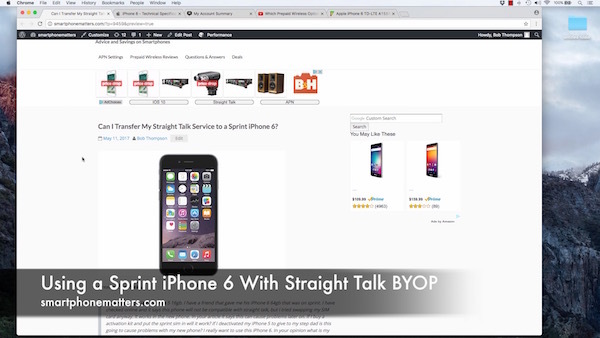 Your Straight Talk iPhone 5 is mostly likely using Straight Talk’s AT&T or Verizon network. If it’s using the Straight Talk AT&T network. You can move the SIM card to the iPhone 6 and it will be fine. If however your iPhone 5 is using the Straight Talk Verizon network, you don’t want to move the SIM. With Straight Talk’s Verizon network, your iPhone 5’s serial number is registered on the network and your account is associated with that phone and SIM. If you try to activate that iPhone 5 on Straight Talk’s Verizon network again you will have need to transferred your service to a new phone or SIM. See my video response below. When you say get a Verizon sim card do you mean from verizon or from straight talk? Because I’m trying to activate my unlocked sprint iphone 7 with straight talks verizon sim and its not working. You would need a Straight Talk Verizon SIM. Did you confirm that the phone was eligible? I have a similar question. I bought an unlocked phone on ebay that did not specify what carrier it initially was. My current phone uses ATT. So when I got the phone the start up screen said sprint. I forgot they are cdma and there was a spot for my sim card so I swapped it over. Phone works. I’ve just been having issues getting it to auto switch from wifi to mobile to download MMS. I chatted straight talk about this tonight and they informed me that my phone wasn’t compatible. If that’s true, why is it working? And is it going to self destruct or something? My sim was used for an ATT phone so I don’t know. Should I just return it to the ebay seller? You did not say what Brand / model phone you bought, but many phones that Sprint and Verizon sell also are compatible or partially compatible with ATT or TMobile. To make things simpler, Straight Talk tells customers ATT phones work with their ATT network, Sprint phone with their Sprint network. etc. Tell me what phone you are using and I might be able to suggest a fix or recommend returning the phone.